If you're like most of us, the stuff in your kitchen is mostly a cobbled-together assortment of hand-me-downs, odd items from the secondhand store, and a cheap set of knives from Target. While that probably gets the job done, you'll feel a lot better about cooking if you update your cookware with the Malle W. Trousseau Kitchen Set ($5,800). Typical of products from the MoMA Store, these are carefully designed items that highlight the beauty in everyday objects. The ultimate kitchenware set, and an extraordinary gift, The Malle W. Trousseau is a collection of 43 of the best kitchen utensils from around the globe. The designer was inspired to create this set when his daughter left home and asked for kitchen items to take with her. Each product has been selected for its unparalleled functionality, beauty, and quality. It comes in a sturdy wooden-framed recycled cardboard “trousseau” organized by function into three trays. 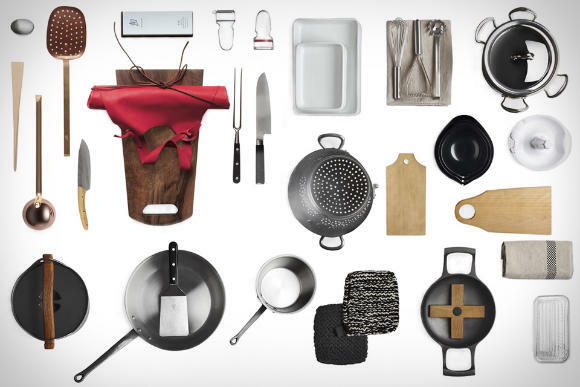 Included in the set are various pots, pans, knives, cloths, towels, containers, dishes, cutting boards, assorted tools, and a leather apron ; nearly everything you need for a well-appointed kitchen.